You can update your results including your weight and measurements to keep track of your progress. We recommend you update your results on a weekly basis, however you could update them as frequently as every day, or less often, it’s your choice. Loading the update results window. Click on the update results button in the main diary window to load the update window. The update results window its quite simple, but very powerful! You can track as little, or much as you want, and use the window to add a new weight or update an existing entry. Start by checking the date is correct (1) for the entry you want to add or update. You can change the date using the two arrow buttons to the left of the displayed date. Next, update your weight (2). The weight will be shown in the units currently specified in your user profile. We recommend you update your weight on a weekly basis, this helps the software calculate the current daily calorie recommendation and keeps the results graphs up to date. You can add a note to accompany the weight measurement, perhaps to remind you in the future how you were doing with your diet at the time. For example you may have had a vacation and want to make a note so in future reports you can see why you did not maintain your diet that week. The additional tracking options (3) are optional, you do not need to use them but many users find them very useful. There is no limit as to how many additional items you can track and you can change the items you want to track to suit your own needs, for example many diabetic users monitor their blood levels. To change the items you are tracking, press the delete icon (4) to delete an item you do not want to track, or the add itcon (5) to add a new field to track. Once you are happy and would like to confirm your entry simply click the ‘OK’ button. 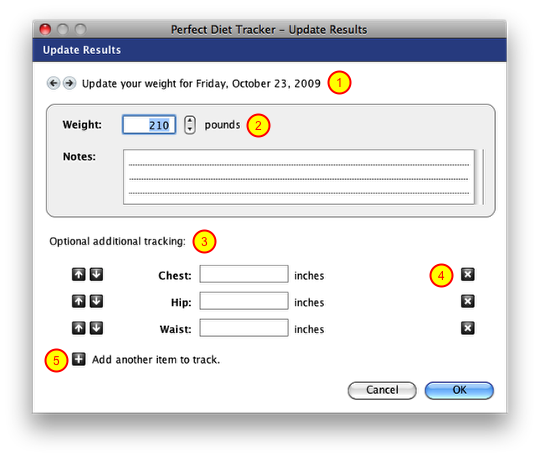 If you have changed the date to a date in the past the Perfect Diet Tracker will warn you that you are about to enter a historic weight, and ask if you want to enter the weight for the date in the past, or use todays date. A useful option here would be the ability to input measurements from skin fold calipers. This would allow users to estimate their percentage of body fat and track body composition as well as weight. Of course these measurements are even more prone to variation than weight measurements, so tracking composition (LBM, fat%) as a moving average would be a good idea. As a side benefit, BMR could be calculated via one of the formulas that incorporate LBM, such as Katch-McArdle, which provide greater accuracy in determining daily caloric requirements. What does the “trend” grey line refer to in the wieght tracking chart? The grey line simply reflects the weight loss or grain trend. It will show the general direction or trend of your weight so even if you have a week where you may not have managed to stick to your diet and not lost weight, the trend line will how your general weight trend is to lose or gain weight. How do you suggest we monitor blood pressure so that it could be graphed over time? If you log into your diary, then select the ‘update results’ button to the left this will load the update results screen. If you then select the + button to the bottom left (Add another item to track), you can enter a name, and the units for any other values you want to track, such as blood pressure readings. You can then update these up to once per day, and graph them in the second tab of the view results window. Can you go back to previous diary entries and update errors? Absolutely, simply go back to the entry you want to change and double click it to edit it.